Central Iowa has been a stormy, wet mess this summer, and it seems all my tomatoes have come down with black speck. 😦 😦 😦 It’s tragically sad! Blessedly, I could salvage a few bites here and there and, combined with a few other summer produce items, dinner was fresh and tasty tonight! Prepare 20 ounces of frozen cheese tortellini according to package directions. This dish was an excellent summer meal! I would absolutely consider taking this to a potluck; it was THAT good! I didn’t plant sweet corn, but I was excited to use my other garden items! It was delish at room temperature, but I think you could reheat in the microwave or serve cold. 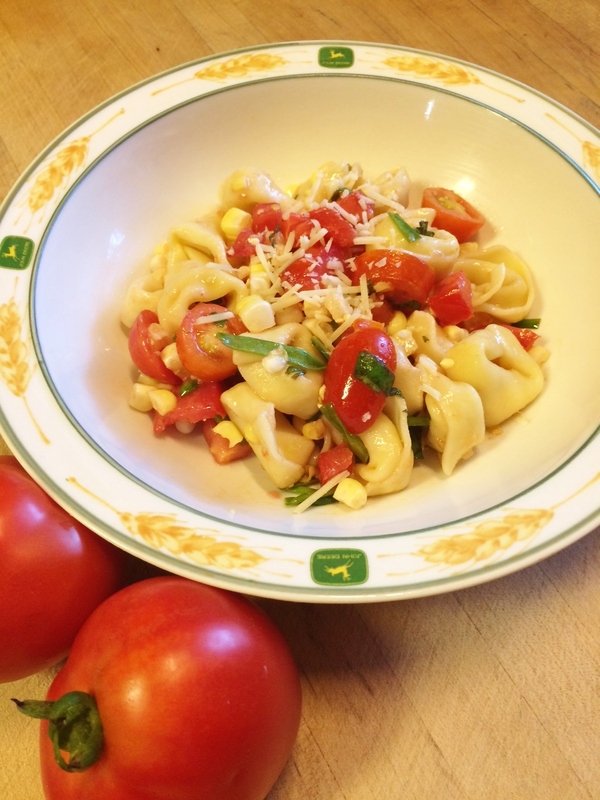 Posted in PastaTagged basil, corn, Easy, garden, recipe, tomato, tortellini, vegetablesBookmark the permalink. Simple yet apparently delicious!!! I’ve done similar stuff with my pasta. I don’t like the heavy sauces (especially the creamy ones) witnessed on many pasta dishes iin so-called Italian restaurants and especially diners in America. This was definitely light and appropriate for steamy summer days! Thanks for stopping by MwM!